Alford CC began their Readers Lincolnshire ECB Premier League season with defeat at Louth. Namibian Xander Pitchers put in a man of the match performance for the hosts, with 70 runs and five wickets. Pitchers and Seb Darke added 83 for the fourth wicket and Darke and Graham West added a further 103. Darke made 106 off 103 balls as Louth finished 274 for seven. Alford started steadily but then lost three wickets with only 32 scored. Jack Wightwick and Andrew White added 62 but from here Louth took wickets regularly. Wightwick was left unbeaten on 91 when the innings ended on 189. Alford now host Grantham on Saturday. This will be followed by Monday’s T20 contest, again at Louth. The Winkworth Cup format sees three clubs playing at each of four venues. Alford will test their skills at Louth where Grimsby Town are the third team. 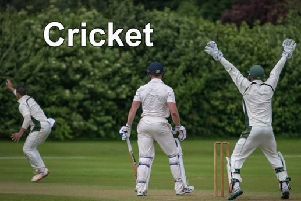 Matches start at approximately 10.30am, 1.30pm and 4.30pm, with the overall winners going on to play in the semi-finals and final at Sleaford CC on Monday, May 29.